Life With 4 Boys: How to Celebrate Mardi Gras, No Matter Where You Are! How to Celebrate Mardi Gras, No Matter Where You Are! Mardi Gras is Tuesday, March 4, but those native Louisianans know that this holiday is not a one day affair. In fact, it can last months for some regions of the state! We have been here in Louisiana this weekend getting just a taste of what Mardi Gras is like. If you can't make it out to the home of Mardi Gras though, and want to learn more about the holiday or just get in on the fun too, you still have time. 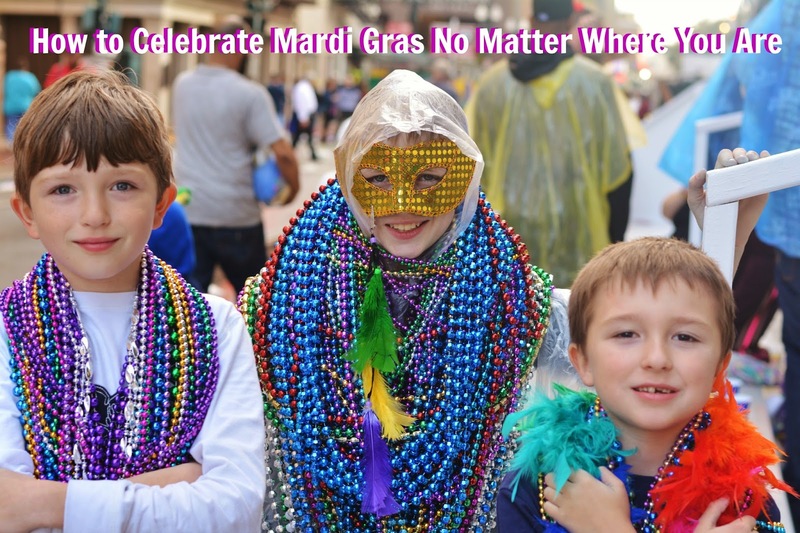 Here are a few kid-friendly ideas to incorporate Mardi Gras no matter where you are. One of the most iconic parts of Mardi Gras are the parades. If you have ever wanted to attend a Mardi Gras parade but never had a chance, organize one in your neighborhood or even in your home. Get dressed up in the green, purple, and gold colors of the holiday, paint your faces, and make floats out of your vehicles, bicycles, and even wagons. If you are at home, have kids make a shoe box float and place their favorite teddy bear in it and parade up and down the sidewalk. Look up recipes of popular Cajun classics and get the whole family involved in cooking them. Make it a gumbo cook-off challenge with your neighbors and friends and charge an entry fee to the cook-off. Give half the proceeds to the winner and donate the other half to a charity. To get you started, here is a great recipe for New Orleans Style Shrimp and Grits. No matter what you choose to do, give yourself some background music and set the mood. Zydeco is a popular Cajun music that is played at almost every get-together in Louisiana. You can find the music online and even download some for a rainy day as a great pick-me-up. If you haven't put it up yet, decorate your Christmas tree as a Mardi Gras tree- a popular custom among Louisiana natives. Set your tables in purple, gold, and green and hang Mardi Gras masks around your home. Get in the spirit of Mardi Gras by living with the décor. Teach your children about Mardi Gras and the true meaning of the holiday by reading them stories and telling them the history of it. Then, teach them how the holiday celebrations have evolved over the years and discuss ways you can celebrate it together. We've loved learning more about how the Mardi Gras parades came about and the traditions behind them while here. While New Orleans is definitely the best place to celebrate Mardi Gras, it is possible to enjoy this festive holiday no matter where you are. How will you celebrate Mardi Gras this year? I know very little about Mardi Gras, so I'm going to be teaching my son- and myself- about it this year! Are there any particular books you would recommend to a littler kid about it? We don't celebrate Mardi Gras here in California but it surely does sound like a fun event though. Mimi's First Mardi Gras and Gaston Goes to Mardi Gras are two great ones for younger kids Shell. I've never celebrated Mardi Gras though I would love to go one day. This is a great idea!!! I have never celebrated it but I know their are a lot of people who do! Great tips to celebrate wherever you are!! Thanks for the tip! Mardi Gras..colorful! Great ideas. I love Zydeco music and I'm totally jealous that you're back down there again. I love that city! I haven't ever celebrated Mardi Gras but these are such fun ideas. Liz, I love it too. I think Mardi Gras may be a yearly tradition for us. It really is a family friendly celebration as long as you keep away from certain areas/times etc. These are some great ideas to celebrate Mardi Gras. I'll definitely keep some of these in mind for our celebrating. I have always wanted to celebrate Mardi Gras in New Orleans. Hopefully that dream will come true someday and I can have fun celebrating at home until then! I really want to go to Mardi Gras but these are great alternatives. I don't really know too much about Mardi Gras, but these are definitely fun ways of celebrating it. We do celebrate it but if we did we'll keep this in mind. We love Mardi Gras. We missed our parade this year though.